Pet Care Game – Find out What’s Inside! Do you have lots of free time on your hand? 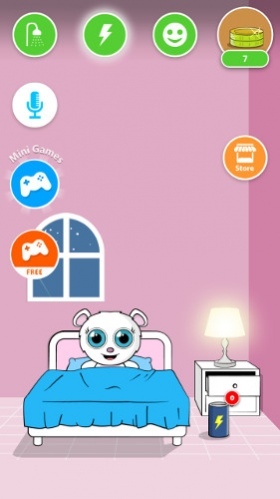 Do you wish to spend it taking care of a virtual pet? If yes, then this pet care game is the right choice for you. Egg for Pou is a game in which you have to try to hatch an egg by striking it multiple times over and find out what's inside. This egg has a very hard shell and you would have to strike it for a very long period of time before you are able to hatch it. The hatching part of this game is quite repetitive and can soon bore you out. However, once you manage to hatch the egg, you get to take care of a cute little pet and make sure that it remains happy, clean and well-rested. 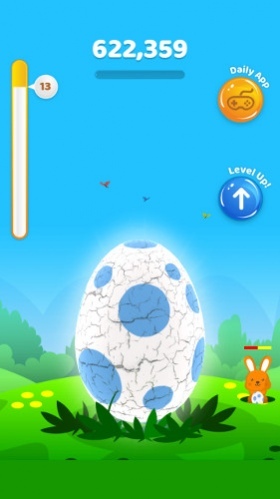 Egg for Pou has a kid-friendly gameplay which ensures that even small children can play it without encountering any issues. The graphics of this pet care game are decent while the controls are not that difficult to understand too. You will find a giant egg placed within a garden when the game starts. All you have to do is to tap your finger on the egg repeatedly until it breaks. There are two meters available on the screen in addition to the egg. One meter is located on the top of the egg while the other on the egg's left-hand side. The first meter fills up with points each time you strike the egg by tapping your finger on it. You can fill up the second meter by increasing your level. In order to increase your level in this pet care game, you have two options available to you. The first one is to continue gaining points until the meter on the top of the egg fills up entirely. It is a painstakingly long process, though. Since you get only a single point for each tap, you will have to tap for a very long time period just to increase one level. You can gain extra points by tapping the bunny that appears for a little while on either side of the egg. The second option for advancing your level in Egg for Pou is to watch a video advertisement. It will quickly raise your level and brings you one step closer to hatching the egg. Egg for Pou can be frustrating at the start because of the slow pace of the hatching process. However, once you are able to break the egg's shell and discover the pet inside, it becomes a lot more enjoyable. You get to take care of the pet that comes out of the egg and perform different activities to keep it happy. For instance, you get to play with it and give it hot baths. When the pet becomes sleepy, it is your job to put it to bed too. You can use this game as a way to teach your children the importance of taking care of pets. It can prove to be a nice exercise for them before you get them a pet of their own. Egg for Pou is a gaming app which will primarily appeal to people who have lots of time on their hands and have a great deal of patience. It provides them with an egg of unknown origin and lets them break its shell by tapping it with their fingers repeatedly to reveal what's inside. It is a pet care game that can help you kill time when waiting for a flight or bus.